We believe in nose-to-tail eating, which means we believe in using the whole animal. We don't raise steaks - we raise cows. We appreciate the resources and time it takes to raise these animals well, so we value every cut of beef. No cow is the same, so expect our offerings and Chef Selections to reflect those changes. 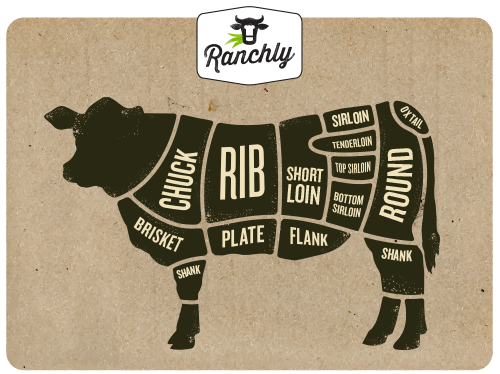 If you want a specific cut, email us at hello@ranchlyusa.com. Different cuts of beef need different cooking techniques. Some cuts are more tender, while others are chewier. Knowing how to cook each cut is important to showcase its best attributes. To better understand how to cook each cut of beef, it's helpful to know what part of the cow it comes from. Cows are broken down into primal cuts, which are then further divided into subprimal cuts. From the subprimal, we're dealing with the cuts that you may already know. Cooking great beef comes down to the two types of heat used: dry heat and moist heat. Dry heat uses air and a little fat (like butter or avocado oil) to cook the beef. Grilling, pan searing, roasting, broiling, and sautéing all use dry heat. Dry heat can caramelize the beef and create a crust that produces a rich flavor profile. Moist heat uses liquid and steam to cook the beef. Braising and stewing are both moist heat methods. Moist heat preserves moisture in the meat while tenderizing and infusing the cuts of beef with flavor. Some cuts are best cooked by combining dry and moist heat methods, such as smoking. As a rule, denser, leaner cuts come from the more active muscles in the cow. These cuts are best cooked low and slow using moist heat. Cuts from less active muscles are more tender and marbleized. These cuts are best cooked using dry heat at a high temperature. The shape of this roast—long and narrow with a pointed tip, like a Tenderloin Steak—is what gives it the name. It comes from the chuck primal. This roast has great flavor. It is a very lean cut, but it is not quite as tender as the Tenderloin, so use moist heat, like braising. Cut from the Round primal and the Sirloin Tip subprimal. This versatile steak can be cooked a number of ways. It can be marinated and grilled medium rare or medium. It can be roasted or braised. Cut from the plate primal. Great beef flavor. Braise, roast, smoke, or grill the ribs. Cut under the front section of the backbone and used primarily for support. From the rib primal, this cut, popular for BBQ is great for grilling, roasting, or broiling. Rich in Iron, copper and vitamin A. Best pan seared for a couple of minutes.